The astonishing story of Benny Binion --- a rip-roaring saga of murder, money, and the making of Las Vegas. Benny Binion was many things: a cowboy, a pioneering casino owner, a gangster, a killer, and founder of the hugely successful World Series of Poker. Blood Aces tells the story of Binion’s crucial role in shaping modern Las Vegas. 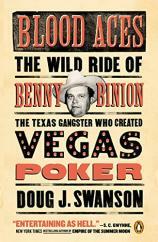 From a Texas backwater, Binion rose to prominence on a combination of vision, determination and brutal expediency. His formula was simple: run a good business, cultivate the big boys, kill your enemies, and own the cops. Through a mix of cold-bloodedness, native intelligence, folksiness and philanthropy, Binion became one of the most revered figures in the history of gambling, and his showmanship, shrewdness, and violence would come to dominate the Vegas scene. Veteran journalist Doug J. Swanson uses once-secret government documents and dogged reporting to show how Binion destroyed his rivals and outsmarted his adversaries --- including J. Edgar Hoover. As fast paced as any thriller, BLOOD ACES tells a story that is unmatched in the annals of American criminal justice, a vital yet untold piece of this country’s history.